I'm that close to the Rockies. Tomorrow my friend Dewey Chiles will be high up in them. Dewey rides the area and knows all the "secret" roads only the locals know about. Some he'll show me. 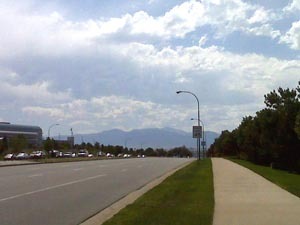 An easy and mostly straight ride today along I-70 and I-25. No weather and no long segments to deal with. After two days of crops, I'm ready for some more twisties!